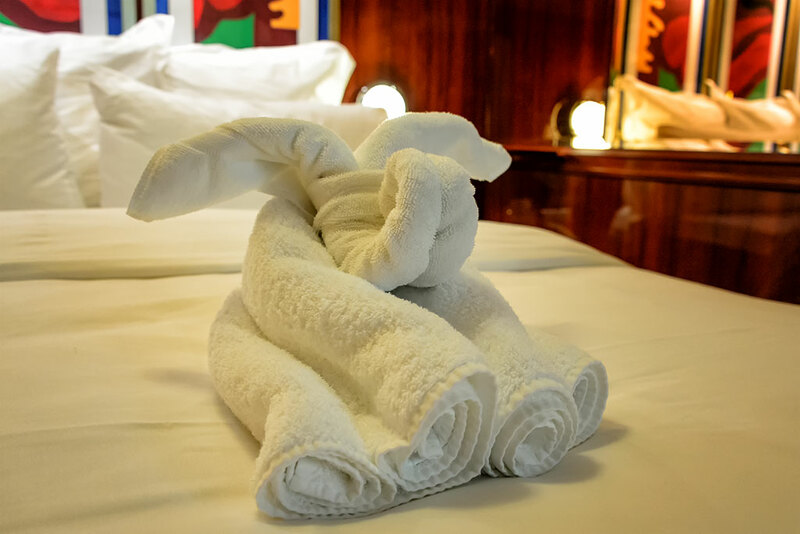 We love towel animals. They are that little extra that makes cruising so special. 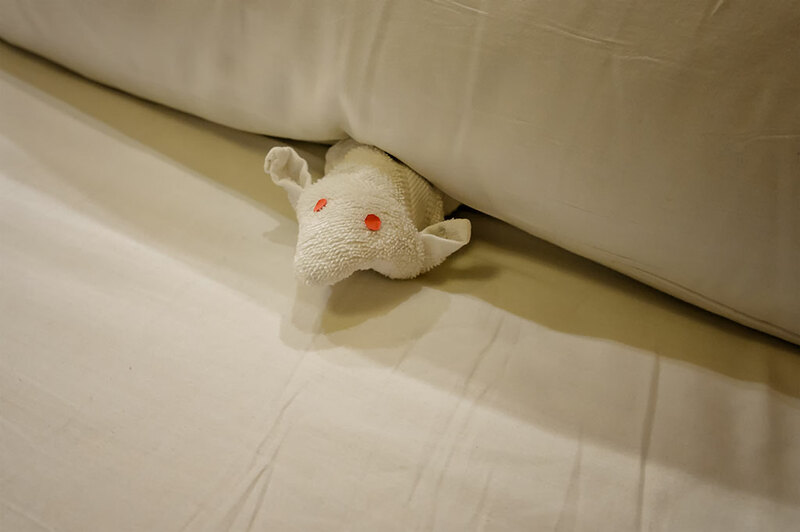 On our recent trip aboard Norwegian Cruise Lines' (NCL) Norwegian Pearl, our fantastic Stateroom Steward, Abner Marcadejas, would surprise us with a new creature every day. These cute creations always appeared after the evening bed turn-down. First up was a fluffy bunny rabbit. The next day we found an elephant in our bed! Luckily it was a small elephant. What would Abner bring us on the next day? It was a dog. 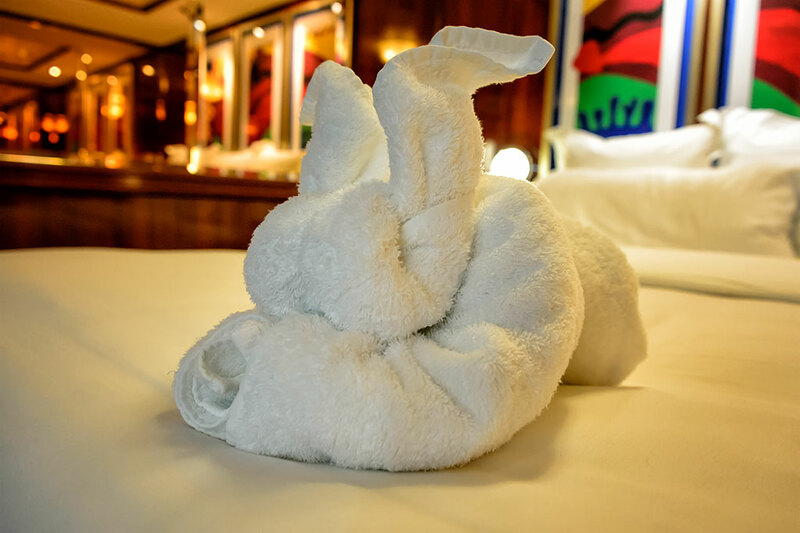 Good thing sailing the inside passage to Alaska is rarely "ruff" or this puppy might have made a mess on the bed. On the next day we expected to find another critter on the bed but we didn't. 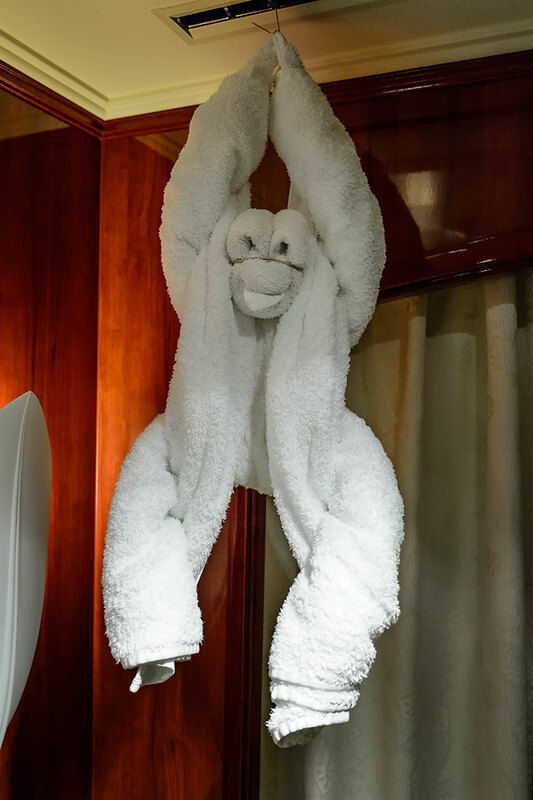 The towel animal was hanging from a vent. Don't you just love monkeys? Abner totally freaked Peg out with next towel creation. Peg had gone back to the room by herself to pick-up something she had left. When she entered the room she heard the TV playing in the bedroom. "That's odd," she thought to herself remembering that it wasn't on when we had left earlier. She slowly entered the bedroom only to find a strange man in our bed! 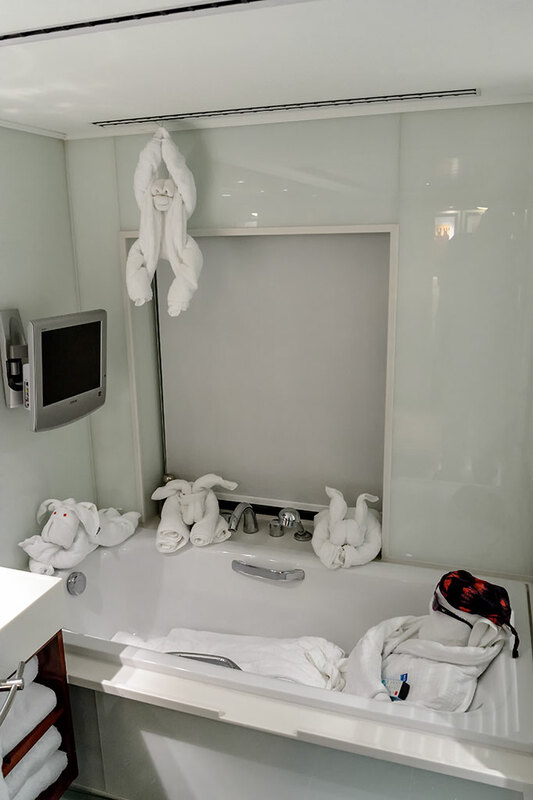 We were saving all our towel creatures. I gathered them up in and around the bathtub to take a group photo. All good things must come to an end. On the last day Abner had to gather all the towels. But he left us one new small creature. Say Cheese! I took his photo. 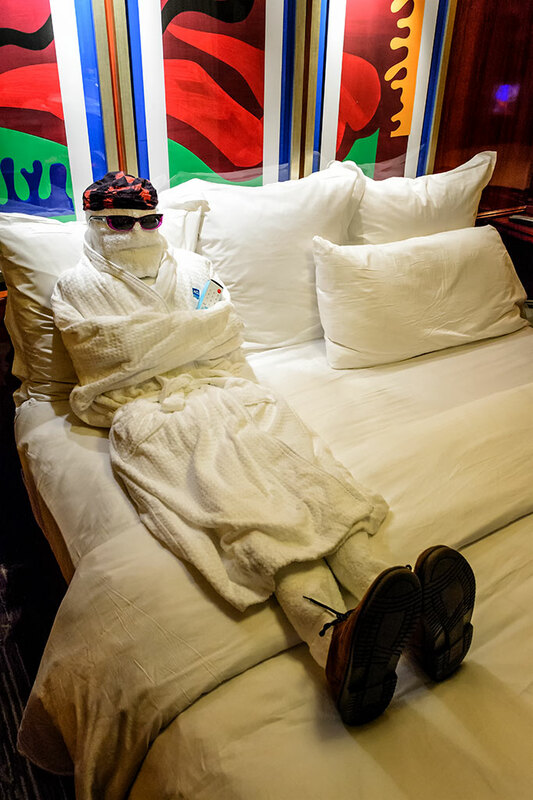 When cruising, be sure to always let your room steward turn down your bed. 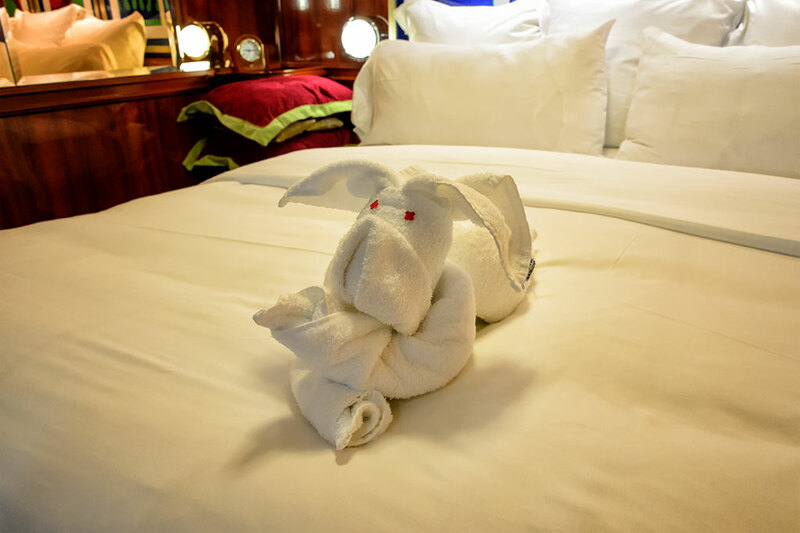 You will more than likely get a little bit of towel animal art to admire.